Music staff dry erase boards. 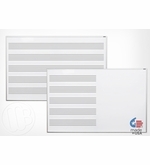 Magnetic wall mounted and non-magnetic personal sized dry erase boards with music staff lines from OptiMA. 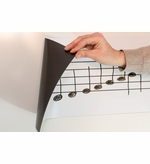 We have created some really great music staff boards using our exclusive Opti-Print Method. The prints are covered with exclusive clear dry erase surface that locks the image onto the board and protects it forever leaving a smooth, clean, perfect erasing and ghost-free music staff dry erase board. We offer a traditional magnetic music board that allows you to use magnetic accessories but our most popular new series of boards are our Economy Music Staff Boards with a non-magnetic dry erase writing surface. Another of our best selling products are our Music Staff Opti-Prints. 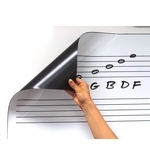 An awesome peel and stick dry erase wall covering with music staff permanently printed onto the material. 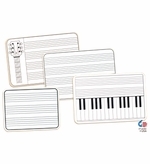 We also offer one of the best selections of hand held student lap boards with music staff lines printed onto one side of the board while a second side is simply plain white. Twice the amount of board for the same price that others charge for one sided units. 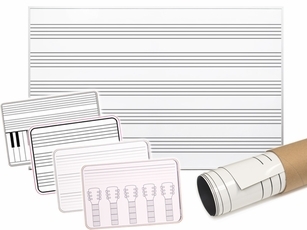 Our free-standing reversible dry erase boards are extremely popular with music teachers. Given the collapse of so many school budgets and the over crowding taking place in many schools, the traditional music rooms are simply disappearing. Now music teachers have to travel from room to room or share a room with another class. Our portable music staff boards are a perfect solution. Same would go for our combination music boards. 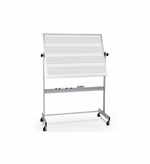 Now you can have both a music staff board and a plain dry erase board on the same unit. No more drawing or taping temporary music staff lines on your board before every period. 4' x 6' Magnetic with Music Staff Print on Either One Side or Both Sides. From "Choose Option" "46C-1: 4' Tall x 6' W Lines One Side (+$795.00)" "46C-2: 4' Tall x 6' W Lines Two Sides (+$950.00)"
A peel and stick dry erase wall covering with music staff lines. Awesome! From "Select Size" "404: 4 x 4 Print (+$99.95)" "406: 4 x 6 Print (+$149.95)" "408: 4 x 8 Print (+$199.95)"
45.25" Tall Roll Up Magnetic Prints in Three Widths. Sticks Securely to Any Steel Surface. From "Select Size" "404: 45.25\" Tall x 45.25\" Wide (+$119.95)" "406: 45.25\" Tall x 68.5\" Wide (+$169.95)" "408: 45.25\" Tall x 92.5\" Wide (+$199.95)"
10.5" Tall Roll Up Staff Line Print in Three Widths. Sticks Securely to Any Steel Surface. From "Select Size" "104: 10.5\" Tall x 44.5\" Wide (+$29.95)" "106: 10.5\" Tall x 68.5\" Wide (+$39.95)" "108: 10.5\" Tall x 92.5\" Wide (+$49.95)"